Day 8: Three Before Lunch! We started out the morning with three passes well before lunch. All were not huge or technical. Cartridge Pass was just above where we camped. It’s a walk up and is easier if you can keep track of where the old trail weaves in and out of rocks and slabs. We couldn’t keep it and just went for where we knew it was. E hiking up Cartridge Pass. We picked the trail back up again at the top and descended into Lake Basin. 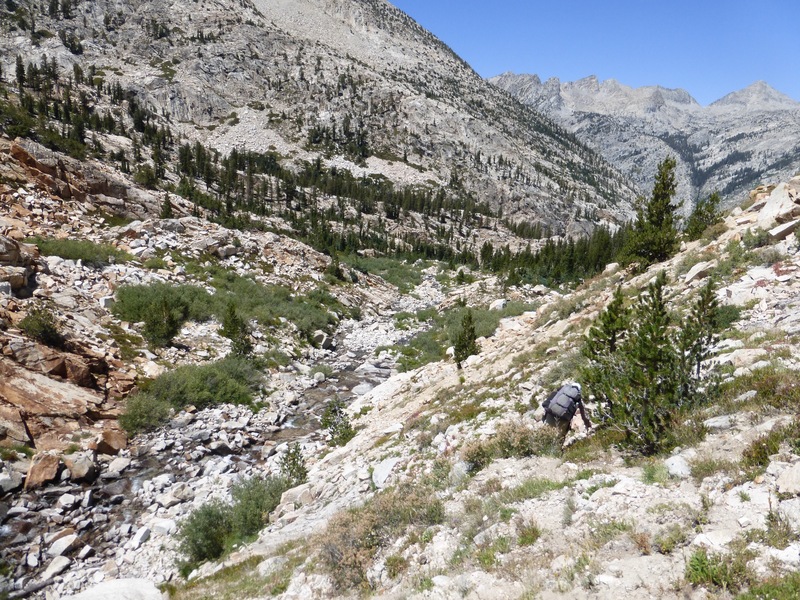 The old JMT used to go over Cartridge Pass and through Lake Basin. 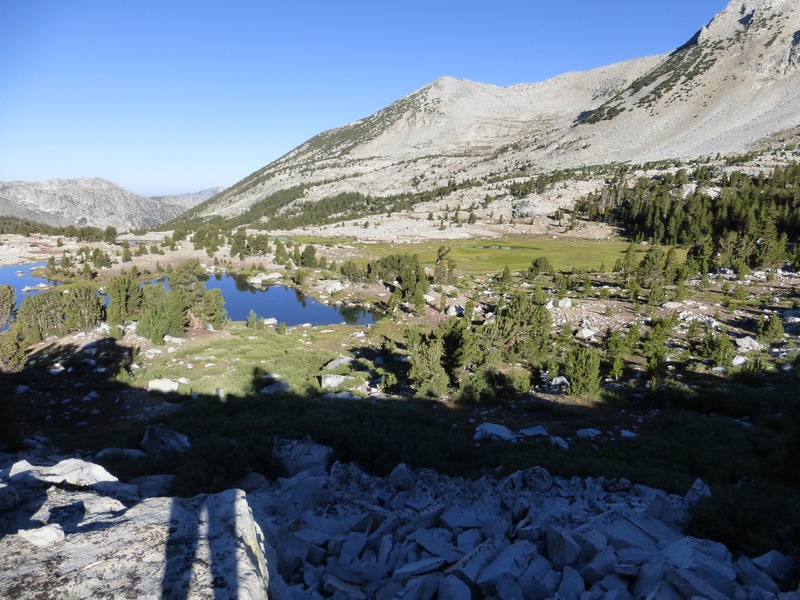 I really like it through Lake Basin (we also crossed through on the SHR) and I wonder why they rerouted the JMT away from it. Being there in the morning was especially serene. 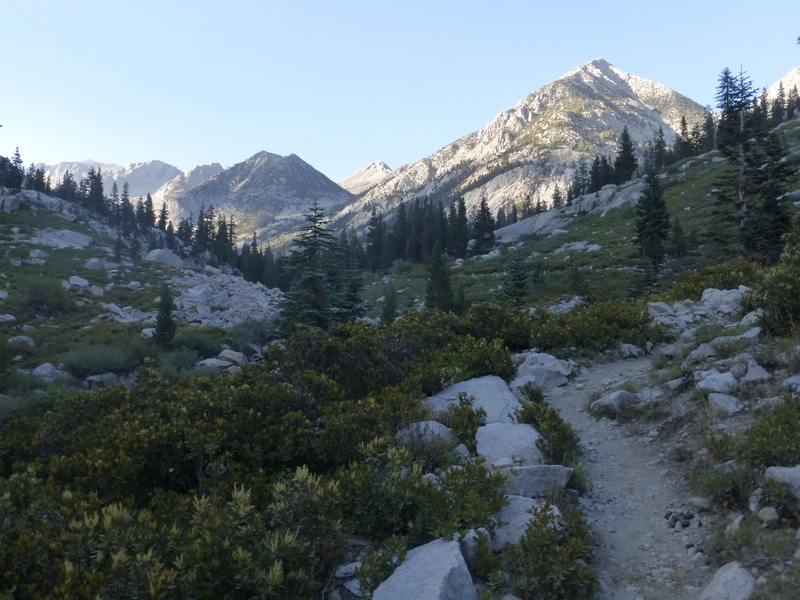 Next up was the hike out of Lake Basin up over Dumbbell Pass to Dumbbell Lakes. Again this one was pretty straight forward and we were up and over before our breakfast break this morning. Dumbbell Pass from Lake Basin. It is right around the corner up higher where the patchy trees are on the upper right. From the top of Dumbbell Pass, we could see our third pass for the morning, Amphitheater Pass. It was directly across Dumbbell Lakes, and looked closer than it was, but that is only half the lake. We had to hike quite a bit around the left lake on medium talus to get to it. E hiking down Dumbbell Pass. Amphitheater Pass is the low dip directly across from her up the left corner of the lake. After a morning breakfast break by the lake, we headed up to Amphitheater Pass. It had a cornice at the top, but it was easy to hike around it. E hikes around and below the cornice on Amphitheater Pass. The lakes today were pretty great. I especially liked the one below Amphitheater Pass. Lake below Amphitheater Pass while looking back at the pass with the visible cornice in the distance on the right. After Amphitheater, the focus shifted to a long descent down Cataract Creek. It was hot today in the mid 80s and there was little breeze as we got further down canyon. There was a faint use trail to follow in and out, but it was slow going and quite hot in the canyon. It was 1-2hrs getting down and we both were pretty desperate to cool off. It takes a lot for me to get in a cold lake or stream, but the final push was that just before we reached the bottom, we went through a burn section that just made the sun more intense and we had soot, brush, and sweat all over us. 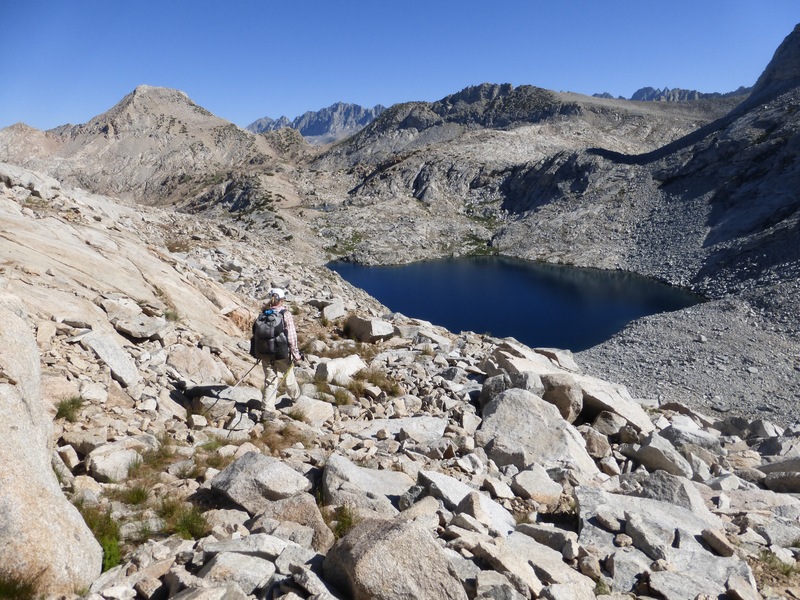 We hit the JMT (for the next 12mi!) 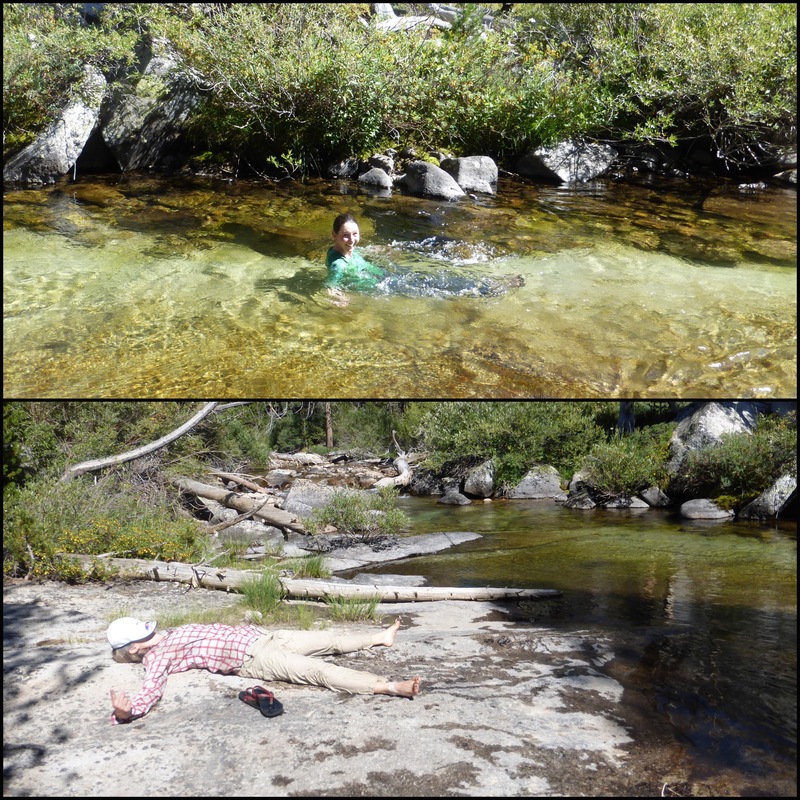 and found a great spot to jump in Palisade Creek and then dry out in the sun. This is the second day in a row that the miles have gone by so well that we’ve taken a bonus 45min break in the afternoon. That really wasn’t expected on a route like this! A rare occurrence of me in cold water. E drying out on the warm rock slab. 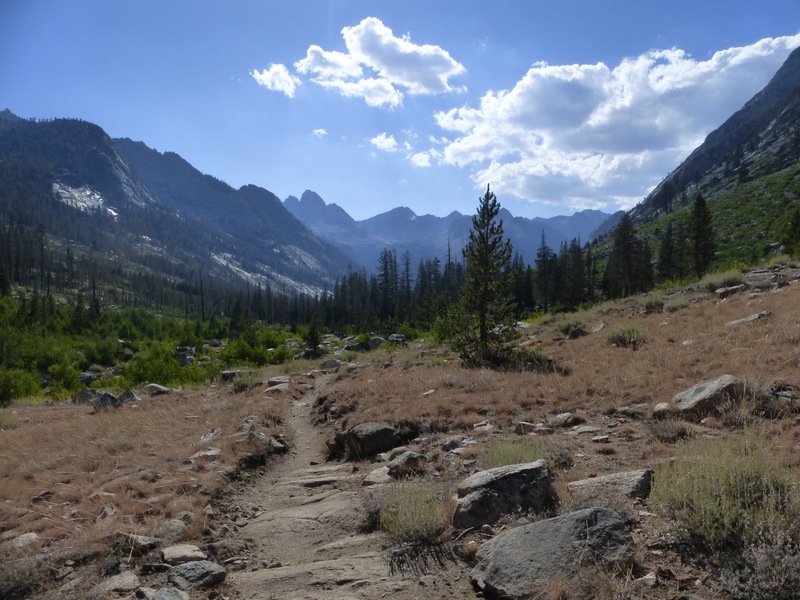 So now we are on the John Muir Trail through LeConte Canyon and up just before Muir Pass. 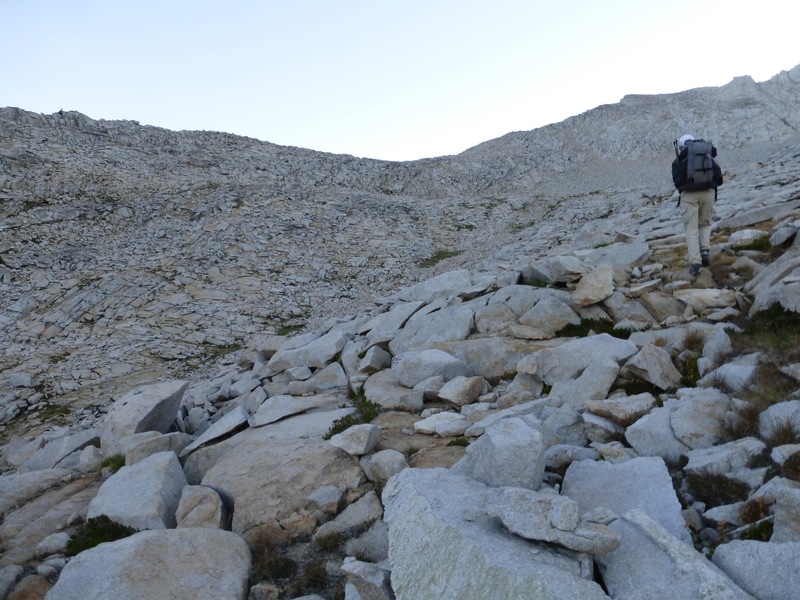 We were on trail for about 4mi today, and for anyone afraid of doing the JMT solo, don’t be. It’s a hiker highway. We saw 25 hikers (15 men, 10 women) and a donkey in our four miles on trail. Many were at camp along the trail at the end of the day. A bonus sighting is that we also saw Chris and Mallory. 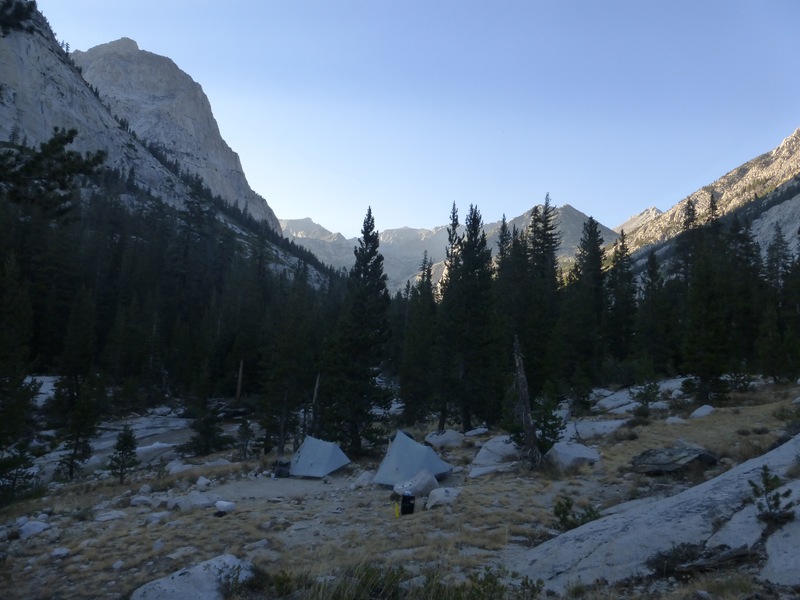 Their route split from ours yesterday morning and they are also on the JMT for a bit until heading back off trail. On the JMT towards LeConte Canyon. Mallory & Chris! (from two days ago on King Col). 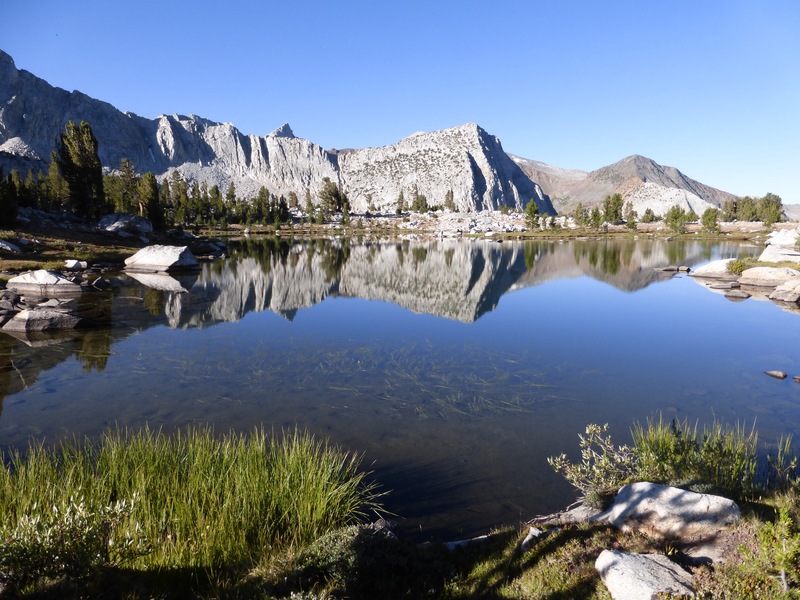 It is perfect that our JMT miles land in an evening and a morning. We both really like the lighting and the relative solitude of hiking at the ends of the day. 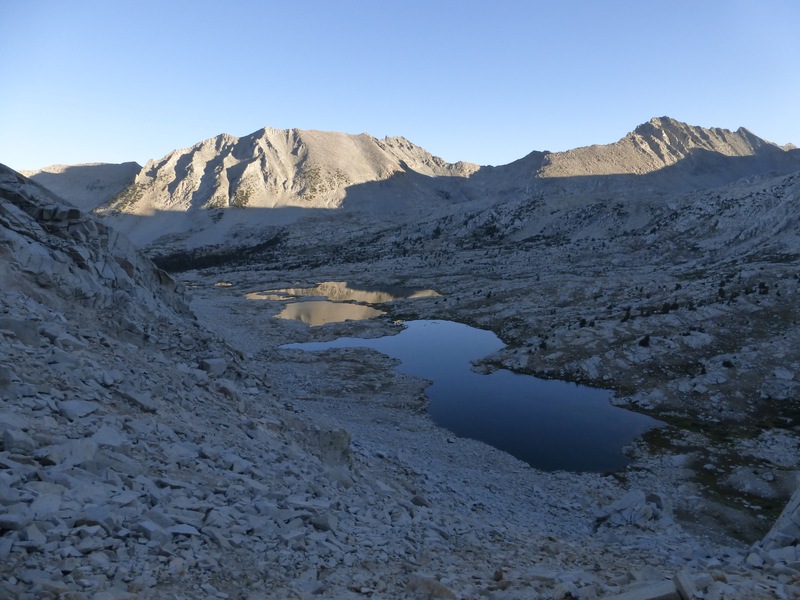 LeConte Canyon ranks up there as one of the grandest and most picturesque parts of the JMT in my opinion. It reminds me of an Ansel Adams photo. We knew we were ahead of schedule, so we decided to finish by 6:30pm, which is early for E, but we were both ready to relax. We found a great little spot along the Middle Fork Kings River. I love sleeping near running water and it was quite full, so I have plenty of white noise. The view of all the surrounding mountains on every side of us is pretty darn cool too. 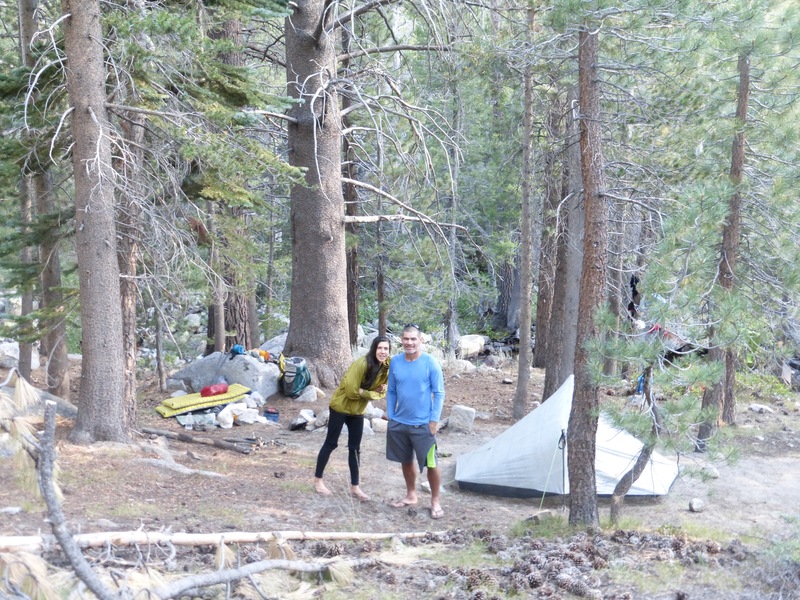 Campsite along Middle Fork Kings River in LeConte Canyon. So, we have a conservative itinerary to buffer for the unexpected. We had no idea what to expect for mileage on this route, and the fact that E was jumping in having not been at elevation much. We knew we were doing 2-3mi or so over our anticipated schedule each day, but the other day there were some miles that weren’t accounted for on the data sheet and I figured we were still just a couple miles ahead of schedule at the end of today. E looked more closely and noticed that we are a full day ahead! I hadn’t noticed because we are camped right where we should be on the itinerary. It’s just that it’s where we should have gotten tomorrow, not today, sweet! Yay! We both like to buffer for anything that might happen, but also don’t like to carry too much weight in food. Now we have plenty of time and food as we head into some of the most difficult and tedious stuff on the route. There is still one spot that may reroute us due to a possibly impassible ford in a couple days, and it’s good to know that if that happens, we have plenty of wiggle room. Tomorrow morning, we get a nice break of 8mi on the JMT. It’s a lot of uphill, but at least we can go on autopilot for the morning. *Side note: Today I am one month away from arriving in Australia, eek! Nice work! Are the water lakes/tarns/creeks warming up as the snow melt slows and the summer progresses or are they still all ice cold? Definitely not as much as earlier in the season. The deeper ones are pretty cold. I was commenting to myself as I read this, just how different your hiking in Oz will be. No mountains, passes, lakes or big or small rocks! You should just eat up the miles! Rotten luck, re the umbrella. Just love your morning reflection shot. Love the reflections! Yes, AUS will be great in comparison, but NZ will definitely have a good variety of trail and brushy muddy stuff to contend with. It’s a lovely area, no doubt about it.. so, if I go walking here, I get great views, and possibly also a nice umbrella? Exactly! It’s like a geocache or scavenger hunt!